Bethesda is betting quite a bit on Virtual Reality, announcing Fallout 4 VR last year and Skyrim VR and DOOM VFR a few months back. Recently, the publisher has confirmed when all three will be released, and it thankfully won’t take long for players to be able to enjoy these VR experiences. In a recent QuakeCon welcome video, the publisher confirmed that the three games will be released before the end of the year. Skyrim VR will launch on PlayStation VR on November 17th; DOOM VFR will release on December 1st on both PlayStation VR and HTC Vive; Fallout 4 VR will launch on December 12th on HTC Vive. Even though Skyrim VR has been originally announced only for PlayStation VR, it’s been recently confirmed that the game will also release on HTC Vive in 2018, allowing PC players to experience this re-imagining of the popular RPG. A true, full-length open-world game for VR has arrived from award-winning developers, Bethesda Game Studios. 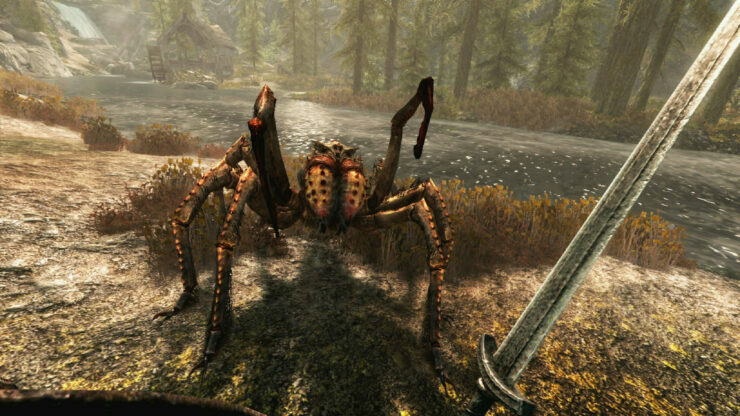 Skyrim VR reimagines the complete epic fantasy masterpiece with an unparalleled sense of scale, depth, and immersion. From battling ancient dragons to exploring rugged mountains and more, Skyrim VR brings to life a complete open world for you to experience any way you choose. The game includes the critically-acclaimed core game and official add-ons – Dawnguard, Hearthfire, and Dragonborn.